Everyone knows the story, or thinks they do. The leg-spinner who rewrote the record books. One of Wisden's five cricketers of the twentieth century. A sporting idol across the globe. A magnet for the tabloids. But the millions of words written and spoken about Shane Warne since h... read full description below. Everyone knows the story, or thinks they do. The leg-spinner who rewrote the record books. One of Wisden's five cricketers of the twentieth century. A sporting idol across the globe. A magnet for the tabloids. 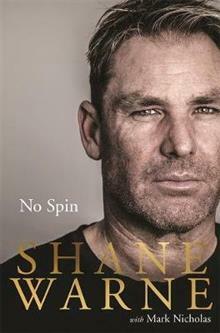 But the millions of words written and spoken about Shane Warne since his explosive arrival on the Test cricket scene in 1992 have only scratched the surface. The real story has remained untold. In No Spin, Shane sets the record straight. From his extraordinary family history to his childhood as a budding Aussie Rules footballer in suburban Melbourne. From the legendary 'Gatting ball' to his history-making 700th Test wicket. From the controversy surrounding the diuretic pill in South Africa to his high-profile relationship with Hollywood star Elizabeth Hurley. Nothing is off limits, and Shane tackles it all with his trademark directness and humour. These days an incisive, charismatic TV commentator and analyst, the 'Sultan of Spin' also lets us in on the mysterious art of leg-spin bowling, revealing the secrets of some of his deadliest deliveries. As Shane says, 'Few batsmen, if any, truly know what I do.' A sporting great, a celebrity, a family man and a self-confessed regular Aussie bloke from the suburbs, in No Spin Shane offers a compelling insight into how a boy from Black Rock changed the face of cricket forever. Shane Warne (Author) Born 13 September 1969, Shane Warne is widely regarded as one of the finest bowlers in the history of the game. Warne played his first Test match in 1992, and took over 1000 international wickets (in Tests and One-Day Internationals). A useful lower-order batsman, Warne also scored over 3000 Test runs. He also played domestic cricket for his home state of Victoria, and English domestic cricket for Hampshire. He also captained the Rajasthan Royals to victory in the IPL in 2008. He officially retired from all formats in 2013 and currently commentates for Foxtel.